Agencies don’t understand brands, and continually complain about cost cutting, bad briefs and bad clients. Brands struggle to find and work with quality agencies, and are overwhelmed by tech companies trying to sell “solutions” that don’t actually solve their real problems. Tech vendors focus only on trying to sell their product without really understanding how marketing teams operate or what agencies need to do to succeed with clients. The problem is that the business of marketing is not understood. Identifying why this is a problem. To understand this and why it’s important, we need to get into the mind-set of brands and marketers. This is the right place to start because marketers are the customer – the ones that hold the key to budgets for both agencies and tech vendors. Marketers run pitches, RFPs and campaigns. But before going there, let’s look at the other players: agencies and tech companies. Agencies should understand that their role, and their entire existence, should be dedicated to help marketers do their job well. This basic point seems to have been lost somewhere along the way. Perhaps it’s been the disruption of technology and digital that’s caused agencies to try to branch out into trying to develop products (too often a distraction), or it could be the rapidly draining talent pool that no longer finds advertising or media particularly fulfilling. There are many reasons, but regardless, agencies have lost sight of their core purpose and to a lesser extent, their business model. Technology companies (selling solutions such as marketing automation, CRM, analytics, social listening, etc.) are much newer to the marketing game. Many leaders in these companies come from fundamentally different backgrounds – they are not marketers but are instead product or tech people who are fascinated by the tech and don’t really have the time or inclination to understand how marketing really works. Inside the mind of a marketer. Keep in mind the context of agencies losing sight of their core focus, and tech companies never being truly grounded in marketing, we can get into the head to understand the motivation of marketers. Marketers don’t really care about ads. They do advertising all the time, but no marketer will ever have KPIs / Objectives based on doing advertising. Marketers KPIs (and remuneration and motivation) are based on increasing company revenue and market share, cutting costs, lifting brand and making customers happy (among other things). Creativity is a nice to have. Its super cool to sit in meetings and see a great idea come together but results always trump the idea. Digital scares most marketers. This fear has left an opening that tech vendors are exploiting – selling “shiny widgets” that are supposed to solve problems, but instead create bigger issues in operationalizing the platforms and having to make significant organizational change. Marketers are terrible at change management. Agencies and tech vendors also don’t address this or help with this at all. It’s the major reason that there’s “no budget” available for campaigns or tech, or that you get a “no” to that proposal. Less than 10% of a marketer’s time is spent thinking about agencies, creative, ads, media selection or campaigns. For tech vendors, it’s much less than 5%. It’s not that these things are not important, it’s just that’s not what a marketer does. A marketer’s job is dominated by building internal relationships, getting buy-in from stakeholders, endless meetings (on sales, numbers, data, etc.) and doing lots of (internal) presentations. 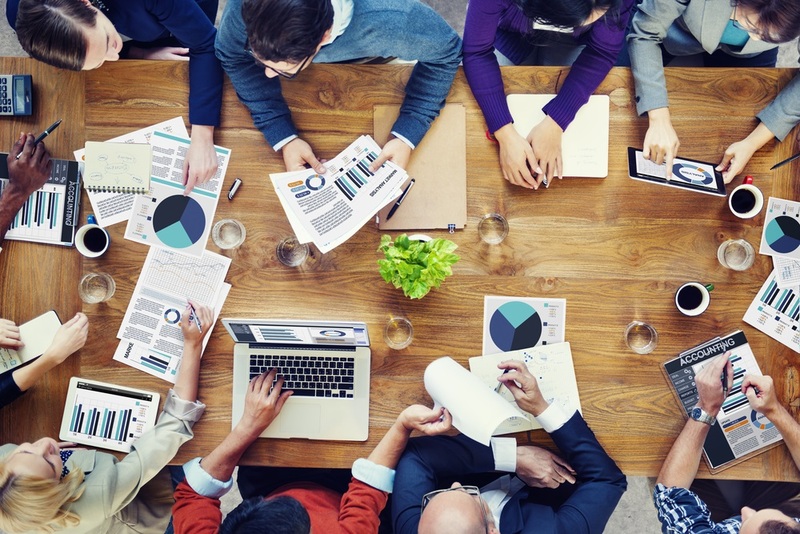 Marketer’s main tools are spreadsheets and PowerPoint, not storyboards and tech platforms. Marketing budgets are fluid, and often tied to pre-planned activities. Budgets change every quarter, based on revenue/profit results. For every new idea presented, something has to be cut. Marketers want to understand the change in the media landscape, how customers are buying their products and what the future looks like. But they are time-poor and don’t know who to trust to help them. Marketing is not easy. Agencies and tech vendors do not make it easier. Overall, there’s very little effort to understand each other (on all sides). For example, when is the last time (if ever), a business or marketing plan was shared by the brand to the agency or partner? Do agencies and tech partners ask to see it? So what is the business of marketing? Helping set these objectives (internally with senior management, sales, product and support teams). Building an activity plan to get there. Reporting on the progress towards the goals (daily, weekly, monthly, quarterly and annually). Putting in place the right marketing capability (people, process, platforms and partners) to support the brand’s growth. The business of marketing is what the brand’s marketing team does on a day-to-day basis to achieve the 4 points above. Still stuck in the mind-set of asking for briefs, happy to be working on campaigns that are tens or hundreds of thousands of dollars. Reactive and burnt out by sharing ideas that never get implemented. This is because client marketers don’t know how to receive innovation or new ideas, often because they are not presented correctly or in a way that’s easy to implement. Trying to solve business problems with advertising. Focusing far too much on product features over (customized, specific) benefits. Neglecting completely the change management element of all new tech programs. This is critical because it’s not just implementing the tech, but it’s more important to train staff, get rid of the old tech and previous processes that this solution is replacing, get a new process in place, update everyone’s KPIs, etc. Generally having underdeveloped communication and empathy skills (replaced by strong sales skills). There’s no easy fixes to these problems as many of them are cultural and are now deeply ingrained in marketing behaviours. Following the suggestion below will help. Objectives: Share as much information as possible – your marketing plan, budgets (if you value transparency and are under NDA), sales targets and your personal objectives / KPIs. Include your agency and partners in on the long term vision. Be clear about what’s it going to take to get your promotion or pay rise. A basic rule of thumb is that you’ll probably get a promotion for bringing in $100m in new revenue, probably not for winning a Gold at Cannes. State up-front what you can say “yes” to, and where you need to influence others. Tell your partners about the approval process that you need to go through to get a new idea implemented. Invite your agencies to ask for volunteers to work on your business. Passion trumps experience, and you need the most motivated people working on your business. Consider having “open days” where agencies and partners can meet your stakeholders and understand how the business runs (e.g. go to a factory where the products are made, visit a retail store or bank branch, sit down with customers). Objectives: Please ask your client for the long term objectives and sales targets. Insist on it. You need to understand the context and why you’re doing what you’re doing. Make the briefing process as easy as possible, but understand that you need to create other occasions for you to talk to marketing clients. If you truly understand their motivations, create opportunities for them to talk about them, and if can work to support them, you’ll win. Understand that no matter how amazing your idea, it means nothing if the client can’t go through a change management process internally to get it approved. Put a greater focus on how they can implement the idea, as well as how much money it might make for the brand. Ideally, an idea would be broken into 4 elements: First, the actual Creative/Media idea; But also time and capability you need to put in and what the client needs to put in to make it happen; Business results (sales, margin, market share, brand); And support material for the approvals that are needed (e.g. a PowerPoint presentation customized to other internal stakeholders that makes saying yes very easy to your client). Build a stakeholder map of your client. Who are they, how they prefer to be communicated with (face-to-face, WhatsApp, call, etc. ), what are their motivations. Then map out that persons stakeholders and who they need to influence. It’s a very handy cheat-sheet to understand how to sell-in new ideas and programs. Learn more about the client’s marketing capability requirements. Develop a plan that gives you context on their technology or plans to buy technology, level of their people’s marketing skills and skill gaps, how they leverage data, etc. This will put you in the driver’s seat in discussions with tech and media partners in the future and will open up new revenue streams. Most importantly, build trust. If you’re a brief-taker, then your agency is a commodity and the decisions about you will be price driven. If you can build trust with individual marketers you become a partner and will see tangible value. Objectives: Please ask your client for the long term objectives and sales targets. Just keep in mind it’s a tougher sell to ask either your marketing or agency client than it is for an agency to ask for from their client. Take the time to understand your clients and what their technology plans are. Rarely is something so unique that a brand won’t have it. Brands have a lot of technology and platforms and it’s often the case that you’re trying to dislodge and incumbent partner. You’ll only do that based on being concrete about achieving the marketer’s objectives/KPIs, not by saying your product is better. Understand the day-in-the-life of a marketer. Really understand what they go through in the business of marketing. The change management process is critical. Like agencies, focus on how they can implement the idea, as well as how much money it might make for the brand or agency. Play nice with agencies and media companies. Build a partnership built on trust and mutual benefit. Marketers trust them more than they trust you. There are often long-standing relationships between marketers and their agencies, with trust being built over many years. Most marketing tech companies are less than 10 years old and marketers don’t know whether you will fail, or whether you’ll be bought by another competitor that we don’t want to work with, or even whether the product will be relevant in 12 months’ time. Sell less and talk more. The majority of the time an approach by a tech vendor feels like it’s a numbers game, with generic intro emails or a thinly veiled attempt to socialize disguised as a sales call or a Connection via LinkedIn that leads to an immediate (and inappropriate) sales pitch. Be genuine, use the brand’s real data and case studies from the same industry to become more relevant in the discussion. It’s critical to really understand how marketers think and what they do in their day-to-day jobs. 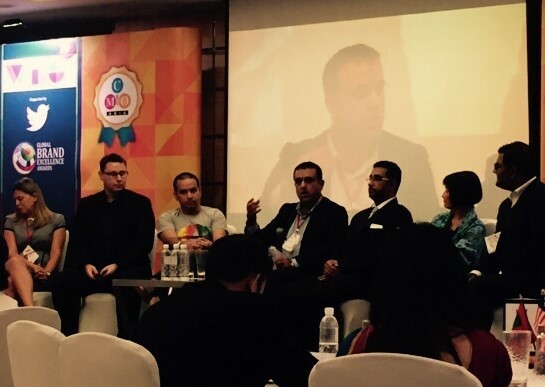 If agencies and tech vendors can understand their motivations and objectives, we all win. 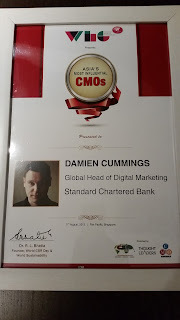 I was awarded "Asia's Most Influential CMO 2015"
Today was an auspicious day. 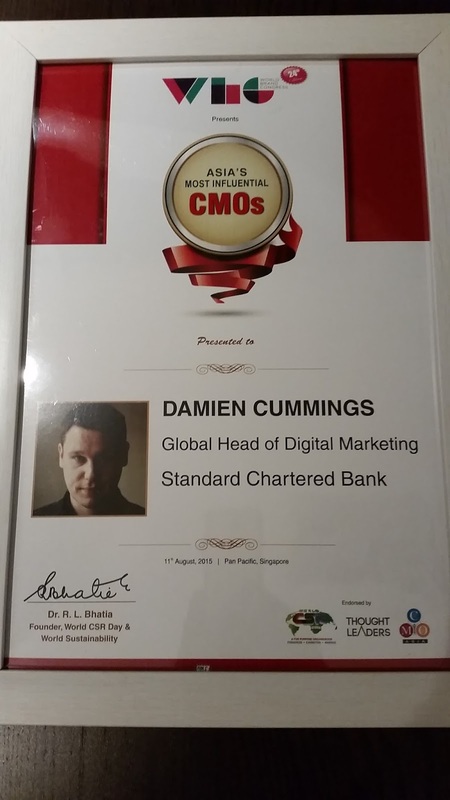 At the 6th CMO Asia Awards and the World Brand Congress in Singapore, I was awarded "Asia's Most Influential CMO 2015". Congratulations to all the other worthy winners and thank you to the judges, and the World Brand Congress team! I am humbled and honoured to receive this prestigious award.